With long red nails on one hand, the other hand is strangely warm to the touch yet with the appearance of some kind of metal scales meticulously added over the entire hand sporting a gold ring with a large red stone sitting prominently on one finger that occasionally catches a beam of light. 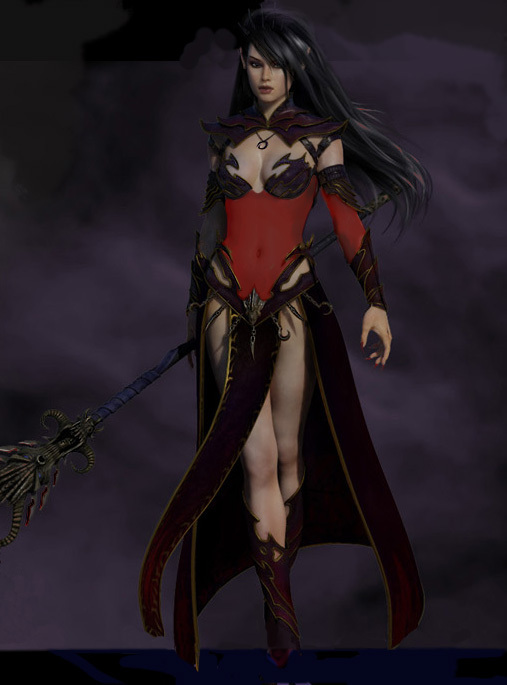 Kyre can typically be seen wearing a red or black bodice accompanied by a dark flowing skirt over her tall elven body. Her armor is usually covered by a master mage robe with the emblem of a raven engraved on the front suggesting her allegiance to the god Nargun. There is a stark contrast between coal black eyes and long pure ebony hair as they frame a pale visage unused to bright sunlight. How many years... millennia? They called her "witch", is that her name, or what she is suppose to say? There was a time she knew, a time she remembered. That whisper in her mind, maybe she should finally answer. The black raven watching from his perch, what trick of the eye will he pull this time...will the pain stop? They called this place "the dead area", maybe she had finally gone mad. Forgetting what she shouted before, the elfess with no remembered name yells "Nargun!". Accidentally scratching the jailer's cheek as he roughly drops her on the cold stone floor in her dank cell, she then inexplicably, not understanding why, brings her finger to her lips. With the taint of his blood tasted, she manages to speak in a hoarse voice "You will protect me". Waking up slowly to a cell door open, Kyre walks in a daze still following the vision of the raven seen in her mind, imagining him speaking to her. "You will leave here Kyre...flame... it is time." Moving from the cave, her "home" for untold years, into a forest as if walking out of a bubble, she knew why he called her Kyre as pain tenfold coursed through her body. Yes, it was fire, but also ice suddenly flowing as she walked from the "dead" area. Abruptly appearing one day on Gobaith with a past shrouded in mystery, Kyre could only occasionally be seen away from her all consuming studies. Vowing never to be captured again, her interests can sometimes appear self absorbed, with actions chaotic similar to the god worshiped. As the island sank, Kyre knew in her heart the world would change drastically, what would the new world hold?